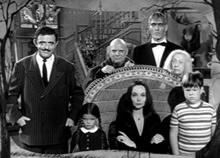 The Addams Family — As reported earlier, plans are underway to bring the creepy clan to the Broadway stage. Now, Playbill reports that Nathan Lane (The Days and Nights of Molly Dodd) and Bebe Neuwirth (Cheers) — both two two-time Tony award winners — have agreed to play the lead roles of Gomez and Morticia in an upcoming closed reading. Though the pair will likely have first option on the roles, they haven’t committed to play the gruesome twosome when the show hits Broadway for the 2009-2010 season. The Addams music is being authored by Andrew Lippa, and Marshall Brickman and Rick Elice are writing the book. The Sopranos — As we mentioned earlier, when James Gandolphi was making The Sopranos, he had a clause in his contract that allowed him to keep his Tony Soprano wardrobe. He recently put 25 of his outfits up for auction to benefit The Wounded Warrior Project, a non-profit that helps soldiers that were severely wounded in Afghanistan and Iraq. The auction raised almost $188,000. The biggest ticket item? One buyer spent almost $44,000 to purchase for the blood-stained attire Tony wore when he was shot by Uncle Junior. Its pre-sale estimate was just $3,000. Quincy, M.E. — We reported earlier that veteran actor Jack Klugman (The Odd Couple) is suing NBC Universal because he believes the company hasn’t been forthcoming with money made from his old Quincy series. The actor’s series deal gives him profit participation. Despite the fact that it’s run for years in reruns, the studio claims the series has accumulated over $66 million in net losses. Back in April, Klugman said, “I recently heard that they made $250 million and it’s still on TV in Germany. I don’t want their money. I want my money. I worked my tail off.” Klugman’s copy of the contract was lost when his agent passed away and NBC Universal refused to give him a copy. A California court has now ruled that the company needs to comply with the request within 15 days. Mister Ed — And speaking of lawsuits, MGM is being sued by the estate of Dorothy Brooks over the studio’s failure to share the profits from Mister Ed DVDs and videos. Brooks’ husband, Walter, wrote a short story about a talking horse back in 1959 and became the inspiration for the popular sitcom that ran for six seasons on CBS. The lawsuit, filed last week in LA County Superior Court, claims that MGM has failed to provide an accounting of profits and owes the estate almost $400,000 in video and DVD royalties. Stay tuned!